Spurgeon Intermediate School Teacher, Stacy Kline, has put together a Bike Club for her students. The focus of the club is fun with cycling, but it all begins with safe riding skills. To reinforce the importance of safety, Kline offers a bicycle safety session for students. During the session, students were surprised to learn from Ms. Kline that it is most often the bicyclists who are frequently at fault in collisions, and with some basic training, most bike accidents and the resulting injuries can be prevented. By taking time to learn how to check bikes before riding, practicing starting and stopping safely, adjusting helmets correctly, learning how to brake properly and developing bicycle control skills, kids can really enjoy the freedom that riding a bike provides. Although Kline conducts the safety session at her school Spurgeon, she wants the message of bicycle safety to reach as many students possible, so she invites other schools to participate. Hector Chavez, a teacher from Mendez Fundamental Intermediate School, rode down the Santa Ana River Path with his students to join the class. “I think riding bicycles is important for the kids because they can use them for transportation, and as a fun sport where they can get exercise,” said Chavez. The plans for the Bike Club include local rides on the Bike Trail that run along the Santa Ana River, and other destinations. Students will be able to increase their skills, and be safer out on the streets and bike paths. 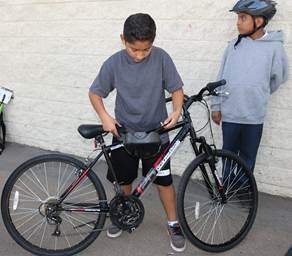 If you want more information about the Bike Club, contact Stacy Kline at Spurgeon Intermediate.